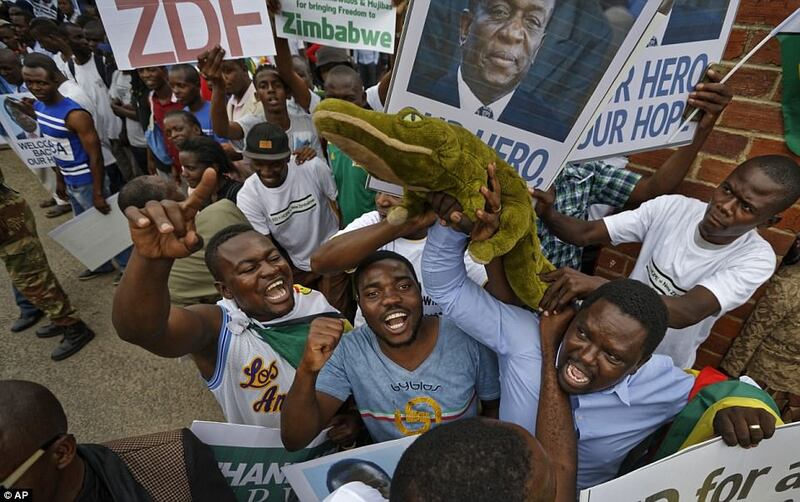 Home » New leader of Zimbabwe is Crocodile! Crocodile is the nickname of new president Emmerson Mnangagwa. Also, he is well-known as the disgraced first vice-president of Zimbabwe, a former rebel and ally of Mugabe who was overthrown during a bloodless coup d'état. 93-year-old Robert Mugabe, who ruled despotically since 1980, vacated finally his post. The oldest politician of the world, whose opponents accused him not only of mass repression, tyranny, excessive corruption, a failed economic policy, but also cannibalism,"resigned" under the pressure of the country that hated him so much. It was announced by Parliament Speaker Jacob Mudenda on Tuesday. He read a letter signed allegedly by Mugabe, who declared that “in accordance with paragraph 96 of the Zimbabwean Constitution”, he was leaving the presidential post. It is difficult to say whether Mugabe actually resigned or not, or he "left" in exactly the same way as almost 100 years before, Kaiser Wilhelm IIdid(in reality, he abdicated only a couple of weeks after newspapers had reported about it). In fear of the fact that the wife of the "immortal" president was preparing to head, a bloodless coup could turn into a bloody one at any moment. It was necessary to hurry. Therefore, no matter if Mugabe signed something or not, his days, as the head of the country, was over. There were also rumors that a deal was signed with his family: Mugabe and his wife Grace got immunity from prosecution and they kept active and non-active assets. But this fact does not matter now. It clear anyway that the most part of their stolen assets will be taken. It appeared to be enough to read a paper “abdication” in the Zimbabwean parliament the so that the holiday began in the country. People were really fed up with hated Mugabe. Now, they have hope, at least. He was taught by Jesuits and he also studied abroad, including in London, then he became a rebel and received power in the country with the help of the West. The West understood perfectly well that unlike the white rulers of Rhodesia which were labeled as "racists", new African leaders, no matter how radical, "revolutionary", even "communistic", they might be, they would give their country to the Western transnational corporations. Because they do not know how to do anything themselves. But they would not forget about themselves, their relatives and their clan. While the new authorities did not expel the white farmers who fed the country, there was still a kind of life, but then it became quite unbearable. Their own currency even disappeared: it was killed by hyperinflation, about 80% of the population was out of work. People began to run from Zimbabwe, which turned into a laughing-stock, but which has objectively everything to live richly and humming. CertainlynotworsethananyUruguay. Do not be frightened: the "crocodile" came to replace the "cannibal" Mugabe. This is the nickname of Emmerson Mnangagwa, who has been the second person in the country, and who is expected to be a new president on Friday. One can only wonder whether he will repeat the path of Mugabe, or still find the strength to become superior to local traditions, in order to add Zimbabwe to just a few economically successful African countries. After all, potentially, Africa is perhaps the most attractive continent for life. There are a lot of minerals, a good climate, there are no problems with fertility. Even a low standard of living can attract massive foreign investments. African countries can even take advantage of the rivalry between China, the United States, and the European Union, which have their own views on Africa. It can take advantage of good relations with Russia that have remained since the USSR, which helped some of them to expel European colonizers, unfortunately, it was obviously premature. But for this, the authorities should think about the interests of the country, not their own pocket. This is what Zimbabweans hope for now. Let's see what will happen, but we wish them, of course, that everything will turn out the best. In many respects, everything will depend on the new president now. Here is his brief biography. He was born in the British colony of Southern Rhodesia in 1946. He belongs to one of the Zimbabwean peoples - Sean, to its sub-ethnic group - Karang, whose representatives are widely represented in the army and security forces today, which is a huge plus for the new president. The downside may be the fact that Mugabe belonged to another tribe that has lost his "man" in power and will start nostalgic for the ex-president pretty soon: the bad is forgotten quickly. Mnangagwa showed his fighting qualities early, after moving to Northern Rhodesia (the future Republic of Rhodesia and Zimbabwe) in his youth, he joined a political struggle and he was expelled because of it at the age of 18 from a technical college. And then he became a real partisan, changed many different groups and even went to study in China. So he gradually became one of the closest allies of Mugabe in the insurgency, acting consistently hard and decisively, for which he received the so-called nickname "Crocodile". He was arrested by the Rhodesian police. He was in prison. By the way, he had good conditions in prison, as long as he had the opportunity to study and get a diploma from the University of London. Then, after a brief period of peaceful life in a neighboring country, he returned to his old life. When Britain forced the white minority in Rhodesia to abandon power in the interests of transnational corporations in 1980, Mangagwa, as an activist of the new ruling party ZANU, entered the government of Mugabe and occupied the post of minister of state security until 1988. In this post, he was noted after the severe suppression of the opposition. Then he occupied other important state posts and lost Mugabe’ favor. Then he returned to power again, providing the Zimbabwean leader with a lot of services, for which he even got under European and American sanctions. In December 2014, the future president was appointed as the first vice president of Zimbabwe, who run defense, security, justice issues and even activities of the Central Bank in the country. Using military support, he was considered number 2 in the country and a potential successor to the president, until powerful spouse of Mugabe, Grace, wanted to take this post. She also contributed to the fall of Mnangagwa. On November 6, 2017, Mugabe sent him to resign, accusing him of "disloyalty, disrespect and duplicity," after which Mnangagwa fled the country. He was "feared for his life and the safety of his family." The army consisted of his tribesmen, did not endure it. So, as a result of the "soft" coup d'etat carried out by the military, Mnangagwa nevertheless turned out to be Mugabe's successor. Once a second person in the failed state becomes the first one. It is clear that when the triumph ends up, the new leader of the country will have serious problems. First of all, it will be necessary to raise urgently the economy. It is essential to provide the inner peace and satisfy the desires of different tribes and their leaders, but so that to avoid a new crisis in the country. Of course, Mangagawa has the knowledge of local realities, strong personal qualities, the military support. That's why he's the Crocodile. But it is also important that he has something more. He has a vision of how to make Zimbabwe developand cease to be a laughingstock, even in Africa. This will depend largely on who he will make the main bet: to the West or China. Only the last option will have a future. As the example, it is more than 10% of economic growth during the last 10 years in Ethiopia. In general, the question whether Mangabag will become a new Mugabe or anti-Mugabe is still open. We shall see.